How can you improve your retirement planning? This book doesnâ€™t pretend to have all the answers. However, it will help you improve your retirement planning. Both those who are planning for retirement and those who are already retired will benefit from the teachings found inside. Hours of live classroom instruction were distilled down to create a single text thatâ€™s short enough to be easily digestible, yet deep enough to hit the key points from in-person retirement planning courses taught by the bookâ€™s author. The book is organized into seven chapters. 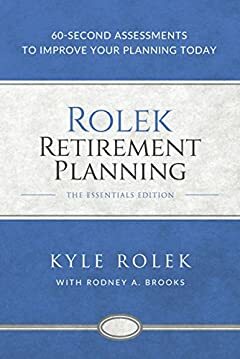 Each chapter is dedicated to addressing important questions and concerns within one specific area of comprehensive retirement planning. The end of each chapter includes a link to a short online self-assessment. Each self-assessment will ask you a series of multiple choice questions related to the topics covered during the chapter. After completing each assessment, a Confidence Score is automatically calculated and displayed. Whatâ€™s the purpose of the self-assessments? The self-assessments serve two main roles. First, theyâ€™ll help you quickly identify strengths and areas for improvement in your retirement planning. Second, theyâ€™ll help you measure your progress. As you learn new things from the book, your Confidence Scores will improve. As your Confidence Scores improve, your retirement planning improves. Better planning ultimately means having a better chance to live an enjoyable retirement. Thatâ€™s what this is all about. â€¢ How will you spend your time during retirement? â€¢ How will you avoid boredom and a sense of loss? â€¢ How much will you need to spend per year to live the life you want in retirement? â€¢ How will inflation impact your expenses over time? â€¢ How much total annual income will you have coming in each year during retirement? â€¢ How can you make the most of your Social Security benefits? â€¢ If you have a pension, which option should you select? â€¢ How much dividend and interest income will your investments generate each year? â€¢ Will your income meet your expenses? â€¢ Do you have a collection of investments or do you have an investment plan? â€¢ How can you control market risk during retirement? â€¢ How can you control inflation risk during retirement? â€¢ How will you use your investment portfolio to generate income? â€¢ How can you prevent emotions from derailing your investment plan? â€¢ How will you be taxed when you take withdrawals from retirement accounts? â€¢ How will you be taxed on Social Security and pension income? â€¢ How can you build tax-free assets into your retirement plan? â€¢ How can you plan for Required Minimum Distributions (RMDs)? â€¢ How much should you plan to spend on health care costs in retirement? â€¢ How can you plan for rising health care costs? â€¢ What does Original Medicare cover? â€¢ How can you fill the gaps in Original Medicare coverage? â€¢ How can you plan for long-term care expenses? â€¢ Who will make decisions on your behalf if you become incapacitated? â€¢ What are the downsides of the probate process? â€¢ Which of your assets would go through the probate process as of today? â€¢ How can you strengthen your estate plan? on the lives of others? Those who diligently read each chapter and complete each self-assessment will benefit the most from this experience.